This page details the Stuxnet virus that hit Iran in 2010. A newer Flame Virus has just been announced that also hit Iran. You can read about the Flame Virus matrix by clicking here. On the first matrix below, STUXNET is the axis term. 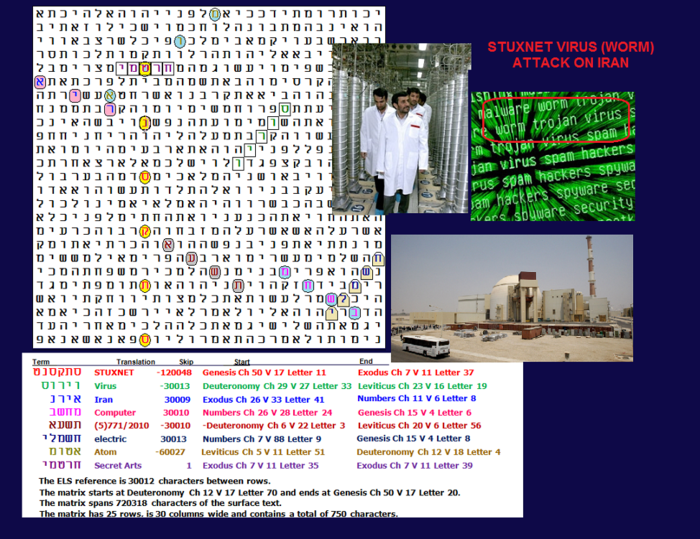 The matrix includes key a-prior terms VIRUS, IRAN, COMPUTER, (5)771 (2010: when the virus hit) ELECTRIC, ATOM; and the a-posteriori term SECRET ARTS which is appropriate for an act of military sabotage. The SECRET ARTS term crosses and shares a letter with STUXNET. IRAN also crosses and shares a letter with STUXNET. 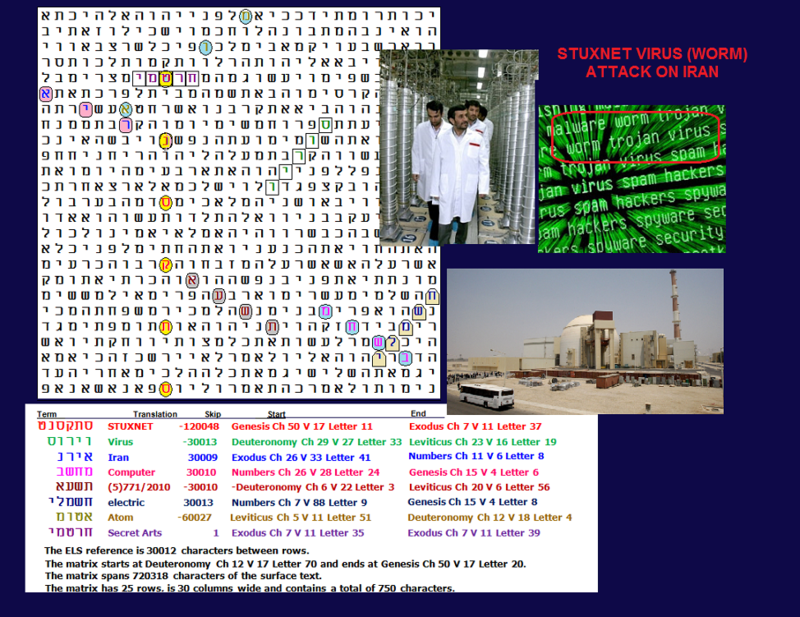 An updated story about how the STUXNET VIRUS is crippling Iran's nuclerar program is offered below the matrix. On the second matrix, the same ELS of STUXNET is the axis term. The a priori key words are ISRAEL and IRAN. The terms THE WATER and ON THE FIRE are a posteriori. It looks like Israel's STUXNET virus has done a good job of pouring water on Iran's nuclear fire. There was about 1 chance in 10 to have an open text reference to ISRAEL and at an ELS of IRAN on the 198-letter matrix. In this Saturday, Aug. 21, 2010, file photo, the reactor building of the Bushehr nuclear power plant is seen, outside the southern city of Bushehr, Iran. TEHRAN, Iran -- In a major setback to Iran's nuclear program, technicians will have to unload fuel from the country's first atomic power plant because of an unspecified safety concern, a senior government official said. While the exact reason behind the fuel's removal is unclear, the admission is seen as a major embarrassment for Tehran because it has touted Bushehr -- Iran's first atomic power plant -- as its showcase nuclear facility and sees it as a source of national pride. When the Islamic Republic began loading the fuel just four months ago, Iranian officials celebrated the achievement. Iran's envoy to the U.N. nuclear monitoring agency in Vienna said that Russia, which provided the fuel and helped construct the Bushehr plant, had demanded the fuel be taken out. "Upon a demand from Russia, which is responsible for completing the Bushehr nuclear power plant, fuel assemblies from the core of the reactor will be unloaded for a period of time to carry out tests and take technical measurements," the semiofficial ISNA news agency quoted Ali Asghar Soltanieh as saying. "After the tests are conducted, (the fuel) will be placed in the core of the reactor once again." "Iran always gives priority to the safety of the plant based on highest global standards," Soltanieh added. Calls to the Russian nuclear agency Rosatom for comment were not answered Saturday afternoon. The spokesman of the Atomic Energy Organization of Iran said the fuel unloading was nothing unusual. "It's a kind of technical inspection and to obtain confidence about the safety of the reactor," Hamid Khadem Qaemi told the official IRNA news agency. He accused foreign media of blowing the issue out of proportion. The Bushehr plant is not among the aspects of Iran's nuclear program that are of top concern to the international community and is not directly subject to sanctions. It has international approval and is supervised by the U.N.'s nuclear monitoring agency, the International Atomic Energy Agency. In a report released Friday about Iran's nuclear program, the IAEA said that Tehran informed the agency on Wednesday that it would have to unload the fuel rods. The agency said it and Tehran have agreed on the "necessary safeguards measures." A senior international official familiar with Iran's nuclear program said the IAEA had no further details. He said unloading and reloading fuel assemblies is not unusual before any reactor startup. The official asked for anonymity because his information was confidential. Soltanieh and other officials have not specified why the fuel had to be unloaded, but Iranian officials denied any link to the Stuxnet computer virus. "Stuxnet has had no effect on the control systems at the Bushehr nuclear power plant," Nasser Rastkhah, a senior official in charge of nuclear security, told the official IRNA news agency. Foreign intelligence reports have said the control systems at Bushehr were penetrated by the malware -- malicious software designed to infiltrate computer systems -- but Iran has all along maintained that Stuxnet was only found on several laptops belonging to plant employees and didn't affect the facility's control systems. Some computer experts believe Stuxnet was the work of Israel or the United States, two nations convinced that Iran wants to turn nuclear fuel into weapons-grade uranium. The Islamic Republic is reluctant to acknowledge setbacks to its nuclear activities, which it says are aimed at generating energy but are under U.N. sanctions because of concerns they could be channeled toward making weapons. Only after outside revelations that its enrichment program was temporarily disrupted late last year by Stuxnet did Iranian officials acknowledge the incident. The startup of the Bushehr power plant, a project completed with Russian help but beset by years of delays, would deliver Iran the central stated goal of its atomic work -- the generation of nuclear power. But the inauguration of the facility has been delayed for years. Iran said when it began inserting the fuel rods in October that the 1,000-megawatt light-water reactor would begin pumping electricity to Iranian cities by December. But it pushed back the timing to February, citing a "small leak" and other unspecified reasons. The Bushehr plant itself is not among the West's main worries because safeguards are in place to ensure that the spent fuel will be returned to Russia and cannot be diverted to weapons making. The United States and some of its allies believe the Bushehr plant is part of a civil energy program that Iran is using as cover for a covert program to develop a nuclear weapons capability. Iran denies the accusation. The Bushehr project dates back to 1974, when Iran's U.S.-backed Shah Mohammed Reza Pahlavi contracted with the German company Siemens to build the reactor. The company withdrew from the project after the 1979 Islamic Revolution toppled the shah and brought hard-line clerics to power. Under the contract, Bushehr was originally scheduled to come on stream in July 1999 but the startup has been delayed repeatedly by construction and supply glitches. An aerial view of Iran's nuclear facility in Natanz. But that didn’t happen, because within minutes all the alert sites came under attack and were inoperative for 24 hours. Experts, including inspectors from the International Atomic Energy Agency, say that, despite Iran's claims to the contrary, the worm was successful in its goal: causing confusion among Iran’s nuclear engineers and disabling their nuclear program. Because of the secrecy surrounding the Iranian program, no one can be certain of the full extent of the damage. But sources inside Iran and elsewhere say that the Iranian centrifuge program has been operating far below its capacity and that the uranium enrichment program had “stagnated” during the time the worm penetrated the underground facility. Only 4,000 of the 9,000 centrifuges Iran was known to have were put into use. Some suspect that is because of the critical need to replace ones that were damaged. And the limited number of those in use dwindled to an estimated 3,700 as problems engulfed their operation. IAEA inspectors say the sabotage better explains the slowness of the program, which they had earlier attributed to poor equipment manufacturing and management problems. As Iranians struggled with the setbacks, they began searching for signs of sabotage. From inside Iran there have been unconfirmed reports that the head of the plant was fired shortly after the worm wended its way into the system and began creating technical problems, and that some scientists who were suspected of espionage disappeared or were executed. And counter intelligence agents began monitoring all communications between scientists at the site, creating a climate of fear and paranoia. Iran has adamantly stated that its nuclear program has not been hit by the bug. But in doing so it has backhandedly confirmed that its nuclear facilities were compromised. When Hamid Alipour, head of the nation’s Information Technology Company, announced in September that 30,000 Iranian computers had been hit by the worm but the nuclear facilities were safe, he added that among those hit were the personal computers of the scientists at the nuclear facilities. Experts say that Natanz and Bushehr could not have escaped the worm if it was in their engineers’ computers. “We brought it into our lab to study it and even with precautions it spread everywhere at incredible speed,” Byres said. One additional impact that can be attributed to the worm, according to David Albright of the Center for Strategic and International Studies, is that “the lives of the scientists working in the facility have become a living hell because of counter-intelligence agents brought into the plant” to battle the breach. Ironically, even after its discovery, the worm has succeeded in slowing down Iran's reputed effort to build an atomic weapon. And Langer says that the efforts by the Iranians to cleanse Stuxnet from their system “will probably take another year to complete,” and during that time the plant will not be able to function anywhere normally."